Linda Ann Ringer Ebeling was born on April 26, 1946, at Camp Lee, a US Army base in Virginia to Dr. Robert Ringer and Barbara Gibbs Ringer. Linda was the oldest of three children. Linda grew up in St. Joseph, MI. Linda inherited her parent’s love for music, taking piano and flute lessons and singing special music in her church choir. After graduating from the 8th grade in 1960, she attended Grand Ledge Academy graduating in 1964. Her love of music continued and Linda sang in her academy choir, in a girl’s trio, and played her flute. In 1961, the family moved to Coloma, MI. Linda’s father worked a dentist and her mother was a homemaker, who devoted much of her time helping poor families in their community. Linda often went with her mother as she visited these families, bringing food and clothing to them. Her mother’s love for helping the poor influenced Linda to become a social worker when she grew up. Linda attended Andrews University, in Berrien Springs, MI graduating in 1968 with a B.A. in social work. A week after graduation Linda married Guy K. Ebeling, Jr., whom she had met four years earlier while working at Camp AuSable, a summer camp. At the time of their marriage, Guy was serving with the US Army and the couple moved to Washington, DC. After Guy’s discharge from the army, they returned Berrien Springs, MI, where Linda worked as a social worker for Berrien County while Guy completed his Bachelor’s degree. After Guy’s graduation, the couple moved to Temple City, CA, where Linda worked as a social worker at White Memorial Hospital in East Los Angeles. In 1976, Linda gave birth the couple’s only child, Lisa. Linda’s marriage to Guy ended a few years after their daughter’s birth. As a single parent, Linda went on to complete her Master’s degree in social work at the University of Southern California in 1979. She eventually moved to Montclair, CA and worked for over 10 years as a licensed clinical social worker in the neo-natal intensive care unit and maternity ward of San Bernardino County Hospital. In 1982, after struggling with issues SDA doctrine, Linda left the SDA church. Nevertheless, her love for Christ remained strong and she continued to nurture her faith in other protestant church families, consistently finding joy in participating in church praise and worship music. As her daughter was finishing college, Linda yearned to enter full-time work in Christian ministry with the urban poor focusing on mentoring single mothers. In 1999, Linda joined World Impact, serving in Wichita, KS for two years. At World Impact, Linda worked as part of team developing curriculum for single-parent family ministry and also participated in church planting. In 2001, Linda felt called to return to the St. Joseph/Benton Harbor area of Michigan where she grew up. For several years, Linda worked as a social worker with a local hospice organization and then in a nursing home. She had a vision of ministering to single mothers by continuing to develop the curriculum begun in Wichita. She mentored several young women, participated actively in prayer ministries, and established a non-profit for single-parent family ministry. Linda hoped eventually to build a residential facility and a nursing home where the young parents might raise their families and work and where Christ would be honored. However, her plans were not to be realized due to the onset of Parkinson’s Disease. She retired in 2011. Linda fulfilled a dream of visiting Israel in September 2011. Shortly after her return, Linda’s Parkinson’s symptoms significantly worsened. With help, Linda traveled to attend her daughter’s wedding in June of 2012. The following year Linda realized that she was not able to continue to live on her own. Her daughter, Lisa helped her move to an assisted living facility in Salem, OR where she lived until hospitalized in September 2017. Her sister, brother and sister-in-law were able to visit her in October 2017. In December 2017, Linda was admitted to hospice. She enjoyed a final special visit from her brother and sister in early December before her death due to complications from Parkinson’s Disease on December 20, 2017. Her faith in Jesus, her Lord and Savior, remained strong until the end, even as her body slowly weakened. 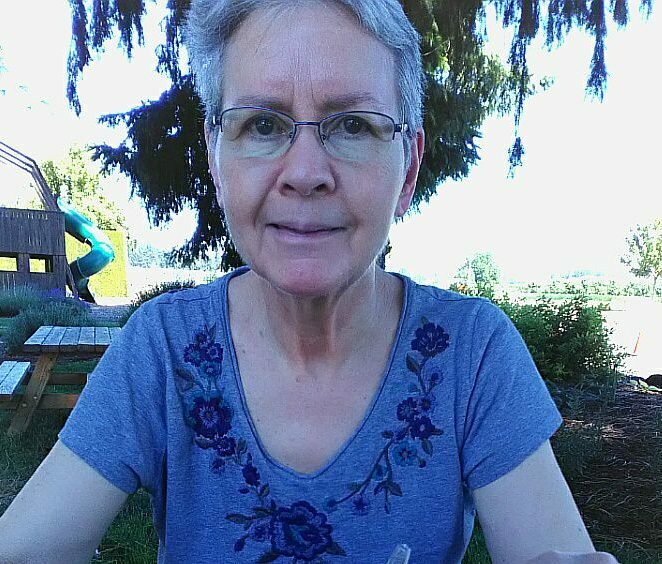 Linda is survived by her daughter, Lisa Ebeling, of Salem, OR; her brother, Wesley Ringer currently of Juba, South Sudan; her sister Janice Grentz of London, KY; her loving step-mother Marlene Ringer of Chattanooga, TN; nieces and nephews, as well as grandnieces and grandnephews and one beloved grand-dog. She follows her mother, Barbara Ringer, and father, Robert Ringer, in death. Friends are invited to join the family for a viewing on January 2, 2018, at 11:00 a.m. at Johnson Funeral Home (134 Missouri Ave. S., Salem, OR 97302) and a memorial service honoring Linda’s life at Sunnyslope Christian Reformed Church at 12:30 p.m. (197 Hrubetz Rd SE, Salem, Oregon 97302). Interment will be at 2:00 p.m. at City View Cemetery. I know linda in haven and in peace ,with setting right side of our fathers . Linda was wonderful person and wonderful social worker. I was co-work with linda and shared office in San Bernardino County Hospital. I am so sorry i los conact with her. May God comfort the family of Linda. Especially my friend Wes, her brother. “Precious in the sight of the Lord is the death of his saints (Psalm 116:15). For all who knew her, Linda will always remain a woman well-loved in heaven and on earth. We grieve this loss and send much love to all the family. Linda, was a nice person. We will see Linda again at the 2nd coming of Jesus Christ!! !